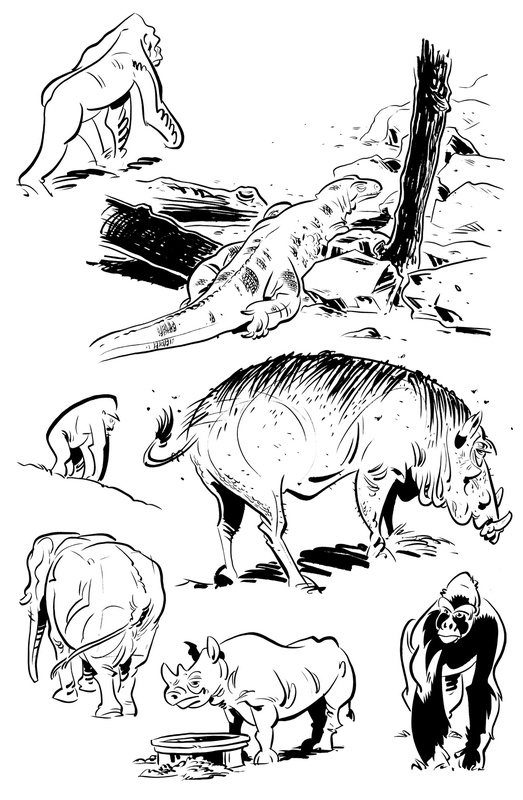 I was just reminded that I never put the zoo drawings up! As usual, click the image to see a full-sized version. I'd been itching to go the zoo lately. Shawn announced that the department will be offering the Animal Anatomy class (which I took as a grad student) this Spring under the tutelage of Doug Dabbs. That, paired up my reading lots of animation books lately, has had me chomping at the zoo-going bit so that I could do some animal drawings. My daughter Penny, who just turned one, is also finally old enough to go, so when my parents and sister (and her one-and-a-half-year-old daughter) were in town last week we decided to take a trip. Penny loved it. She loved looking at the animals, especially the naked mole rats. She and her cousin had a great time, the adults all had a great time, and zoos are pretty much awesome. Also, thanks to our membership, we may get free admission elsewhere, including Greenville, which is right by where my parents live. So, huzzah! Hopefully these will be the first of many animal pics. Oh, and the Komodo dragon is shedding his skin, not injured. And that gorilla was sleek and muscular, and did not like us being so close to him. He repeatedly secreted a sharp, acrid musk that had our nostrils burning. Nice! Love to draw at the zoo. Used to take all my drawing classes on field trips...great practice drawing a moving target. There we go! Love the warthog and Komodo the best, but the slightly annoyed rhino is awfully nice, too. Great drawings. We used to be members of the LA Zoo, but gave it up because we had not gone for quite awhile. You gave me the urge to go back. Very cool. Do you ink on location? Do you use a brush pen? I have been looking for a good brush pen.